These are the 8 most amazing buildings from the Marvel Movie Universe and what they look like in real life. You can visit them too! So you’re a fan of Marvel movies or just have seen a few blockbusters. They certainly have a budget to create stunning scenes with amazing effects but have you wondered about some of the buildings in the movies that look so fantastic as well. We’ve checked out the latest Marvel movies with this thought in mind. There aren’t that many impressive pieces of real-life architecture, but we did find some gems. Ane here they are. Check out the best real life buildings from Marvel Universe and maybe visit them too! 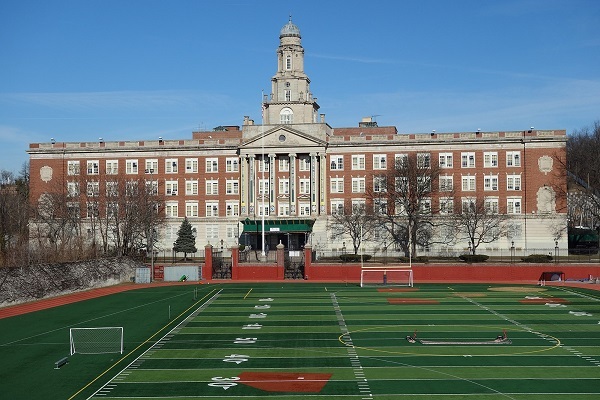 The Middletown High School that Peter Parker attends in Spiderman is Franklin K. Lane High School in Brooklyn, New York. The school building was used for filming the exterior, while the interior was used from an entirely different location. It’s a magnificent turn of the 20th-century architecture marvel (see what we did here? ), and there’s no wonder this building was chosen for the movie. Erik Killmonger is visiting the Museum of Great Britain (the British Museum in real life), but it’s not even in London. The filming took place in this building of amazing modern architecture that is the High Museum of Art in Atlanta, Georgia. The beautiful exterior was not featured in the movie (it’s nowhere near the style of the British Museum), but it’s a beautiful building to be admired in real life. You would think that a movie taking place in alien planets would not feature any buildings from Earth and everything is just graphic-effects and stages. But in fact, several landmarks were used in the movie. One of the notable buildings was the Liége-Guillemins Railway Station in Belgium posing as the Xandar Plaza in the film. And you can see why the building was chosen. The futurist exterior inspires excellent imagination. Are you sure it’s not built by aliens? Stark Industries HQ in the movie is the headquarters of a medical technologies company called Massimo, located in the city if Irvin. And it’s not even the first time this company was a set for a movie. They sure have a thing for movies. The modern building has a beautiful exterior and fitting interiors for science fiction indeed. Remember the place? This is where the final battle between Thor and Malekith took place. And it’s the Old Royal Naval College in London in real life. It’s a monumental building and worth a visit anytime you travel to London. Now you have another reason to visit it! Paul Rudd moves into an apartment in the Milgram Hotel in the movie. But it’s the Riviera Hotel in San Francisco. It was a luxury hotel when it was built in 1907, but now it’s past its glory days and serves as the cheap housing. The building is a typical example of the architecture of its time, but it looks interesting in today’s urban landscape. What is a small hospital in the movie, where a van hits Thor in the first scenes of the film, is an office building in Santa Fe, New Mexico in real life. It does look like a hospital. Toney Anaya Building is a beautiful example of mid-century modern architecture that’s elegant and sophisticated. Pier 13 where the chasing scene took place in Captain America is the Titanic Hotel at Stanley Dock in Liverpool, England. This one is quite a shocker as that’s nowhere near the streets of Brooklyn. The movie doesn’t do justice to the hotel in the film at all, and you’ll see why. With old industrial exteriors, the hotel features impressive Bohemian style interiors of the rooms. You can see how the filming crew got their perks while filming the movie!